Frame Padding in Nuke? Pad Thai? Most first timer to high-end compositing will often work with a video container like MOV or MP4 in After Effects or maybe Photoshop (when it support basic video editing). Still the best approach when working with any compositing job is using image sequences. 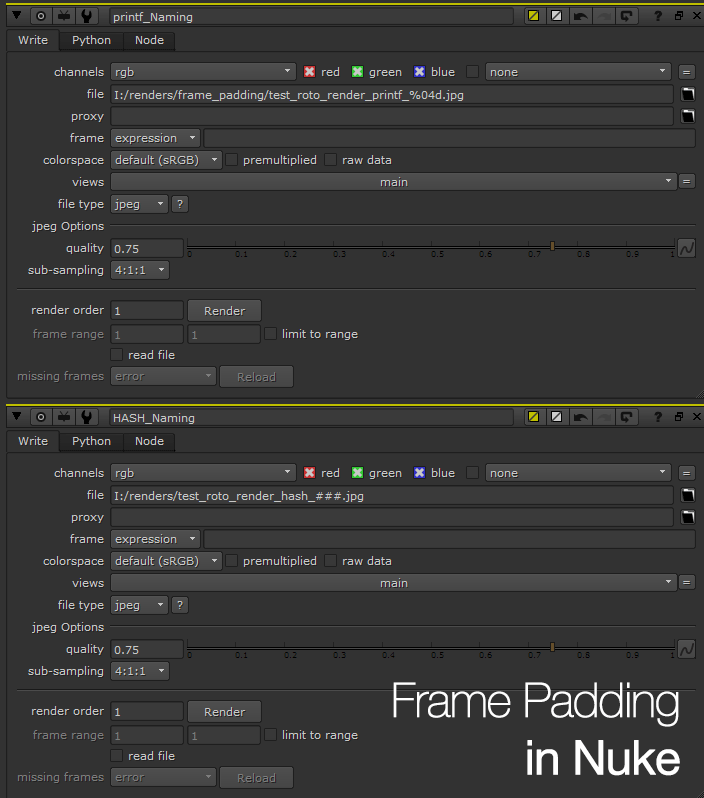 In Nuke, it support both the hash numbering (###) or the printf notation (%01d) to show the frame number padding. For those who uses Shake, they will be familiar to the printf notation as Shake doesn’t support the hash numbering which both Nuke and After Effects support. Every hash symbol indicates the possible frame padding so ### means three digits. The printf method relies on the number that you defined to show the total digits so %04d means four digits. Why should I care for those digits? For starter, it helps to know the difference between both methods as this can help you to identify the numbering on the actual file easier. Another thing to consider is during actual collaboration project where it is best to synchronize with your other team members on which frame padding method and settings to use. Nothing worse than knowing the 3D team is rendering out using 3 digits and the compositing team is using 4 digits for the filename render output. Nuke relies on the image sequence numbering to determine the frame range for the particular Read input. For example: An image sequence labeled as “3D_Spaceship_010.exr” to “3D_Spaceship_184.exr” will only be read from frame 10 to 184 in your composition. Also if you doing Python scripting in Nuke, take care you do not use any space in your output file name. You can always substitute it using underscore “_” and try to make it as a habit since accessing files using Windows command prompt and OSX/Linux Terminal will be not be a nightmare when you have spaces in the image sequence filename. Which only works for Windows? Problem is Nuke is available for three different platform aka Windows, OSX and Linux environment. Since I’m still learning the in and out of Nuke’s Python scripting (which they have an option to define the use the OS default user directory but I got no idea if it actually works on OSX and Linux), just change the file path to the appropriate location where you want it to save to see it in action.